The Miller’s + Mpix Loyalty Program came into existence after countless conversations with you – our valued customers. In its simplest form, the Loyalty Program is a way to earn additional income by referring your clients to Mpix. 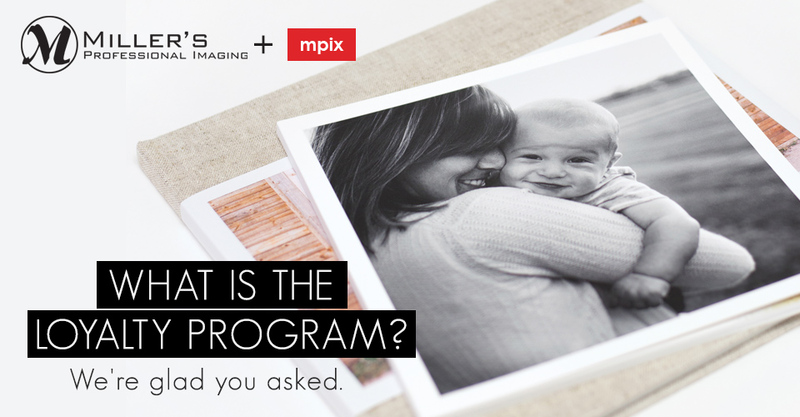 If you already provide digital files and recommend Mpix, the Loyalty Program is a no-brainer. Just upload your images into the Loyalty Dashboard and watch your earnings grow. Just think about the possibilities. Instead of spending hours designing Holiday Cards or Graduation Cards, you can give your client their digital files and and let them create their own premium Card through Mpix. Plus they have tons of great options! You can even limit what products your clients can order by sizing down your file for Cards or 4×6 Prints. As always, you get a 10% commission on any purchases. Hi Ballad, we’re happy to help. Are there certain aspects of the Loyalty Program on which you would like more details? Hi Tammy, if you can contact our customer service team we will walk you through the process!